Authors: Sarah M. Horst, Chao He, Nikole K. Lewis, et al. Clouds and hazes: the enemies of any observational astronomer. Many astronomers have missed observing their target simply because clouds got in the way. Yet clouds and hazes are everywhere, and not just on Earth. Every Solar System body with an atmosphere, be it planet, dwarf planet, or moon, has some form of aerosol in its atmosphere, from the thick clouds on Venus, to the optically impenetrable haze on Titan, even on Pluto! So it should come as no surprise that we have observed clouds or hazes on multiple exoplanets, especially on the cooler (<800K) and smaller (Neptune-size or smaller) planets. It is difficult to decide what is to blame for “clouding out” our observations of exoplanets from theory alone. Today’s authors set out to recreate hazy exoplanetary conditions a bit closer to home. Clouds, Hazes, and Aerosols … Oh My! Aerosol – a general term for any particle (solid or liquid) suspended in an atmosphere, regardless of size, chemical property, or formation. Both cloud and haze particles are also aerosols. Clouds – Solid and/or liquid particles in an atmosphere formed via condensation of atmospheric gases (example: water clouds on Earth, ammonia clouds on Jupiter or Saturn). Haze – Solid particles, in an atmosphere formed by photochemistry, or the breaking apart of molecules and having them combine to form other molecules. This normally occurs when a molecule, for example, methane ( ), comes in contact with an energy source such as a solar photon. The carbon and hydrogen atoms split apart before attaching themselves to other molecules present in the atmosphere. Titan’s haze layer of tholins is an example of this process. In this paper, the authors focus only on the creation of haze in exoplanet atmospheres. In exoplanetary science, we tend to focus on either the theory or the observations, however, there is another side that often gets overlooked – the laboratory experiments. After all, between the extreme pressures, temperatures, and largely unknown atmospheric compositions, exoplanet atmospheric conditions are difficult to create in a lab; difficult, but not impossible. As demonstrated by the authors, laboratory experimentation may prove crucial in aiding our understanding of exoplanet aerosols. Aerosols do a fantastic job masking absorption features in a planetary spectrum leaving us with a flat spectrum, as in the case of super-Earth GJ1214b (Figure 1). Since these solid aerosol particles scatter and absorb multiple wavelengths of light, we are left with no spectroscopic information of their composition. We know that a cloud or haze layer exists, but we don’t know what it is made of. Aerosols play a crucial role in the temperature and atmospheric dynamics of a planet. Furthermore, they can create hydrocarbons which are necessary for habitability. We therefore need more information regarding their creation and composition if we have any hope in constraining our atmospheric models. The work done by the authors is the first step in bridging the gap between our flat spectra and theoretical models by determining the haze production rates (how fast is haze produced) in different hypothetical exoplanet atmospheres. So How Do You Create Exoplanet Haze In A Lab? Each exoplanet experiment required three assumptions: atmospheric temperature, atmospheric pressure of the haze layer, the starting chemistry. The authors assumed an experimental pressure of 1mbar and chose three temperatures: 600K, 400K, and 300K. The challenging part was determining the starting chemistry of their atmospheres. Using atmospheric chemistry models, they created 9 different atmospheric compositions, three models per temperature. These starting atmospheres varied from hydrogen dominated chemistry to carbon dioxide dominated atmospheres like Venus to a water dominated atmosphere, which is unlike any Solar System object. Figure 2 illustrates a complete breakdown of the chemical constituents in each experiment. The authors ran each experiment through the Planetary Haze Research (PHAZER) Chamber (schematic of this setup shown in Figure 3). 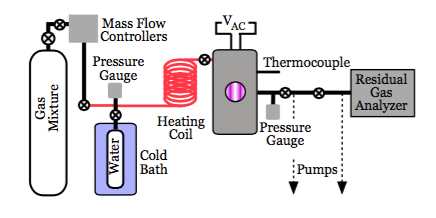 The gas mixture from Figure 2 is sent through the chamber heated to the appropriate temperature with the heating coil. Since we can’t use UV photons from a star, a voltage is applied to the gas to simulate the star’s energy source, which breaks down the particles. These particles then recombine forming the final haze molecules. After 72 hours, the haze particles are weighed and the haze production rate is calculated. Figure 4 plots the final production rates for each atmosphere, with each experiment corresponding to the starting atmospheric chemistry plotted in Figure 2. The authors found that the haze production rates for all experiments spanned two orders of magnitude! Furthermore, the production rates varied by orders of magnitude for the same temperature. 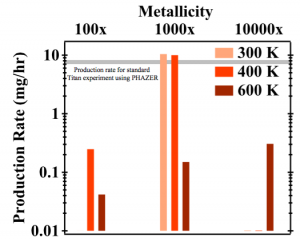 Two of the experiments, the “1000x metallicity” at 300K and at 400K, yielded faster haze production rates than Titan. Both of these had starting compositions that included methane. However, the third highest production rate had no methane, demonstrating that there are multiple gas combinations that can create haze. 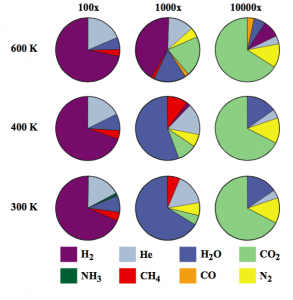 From these experiments, the authors have clearly demonstrated that haze rates, and thus hazy atmospheres, are extremely dependent on not only the temperature of the planet, but also its chemical composition. Unfortunately, we don’t know an exoplanet’s atmospheric composition prior to planning an observation, which means we still run the risk of observing a flat cloudy/hazy spectrum. But by combining continued laboratory experiments with better informed theoretical models, we may yet be able to determine which exoplanets are most likely to have a clear atmosphere, free from hazes or clouds. And with JWST launching in the near-future, the knowledge gained from these future experiments will prove invaluable in determining the best exoplanets to observe.